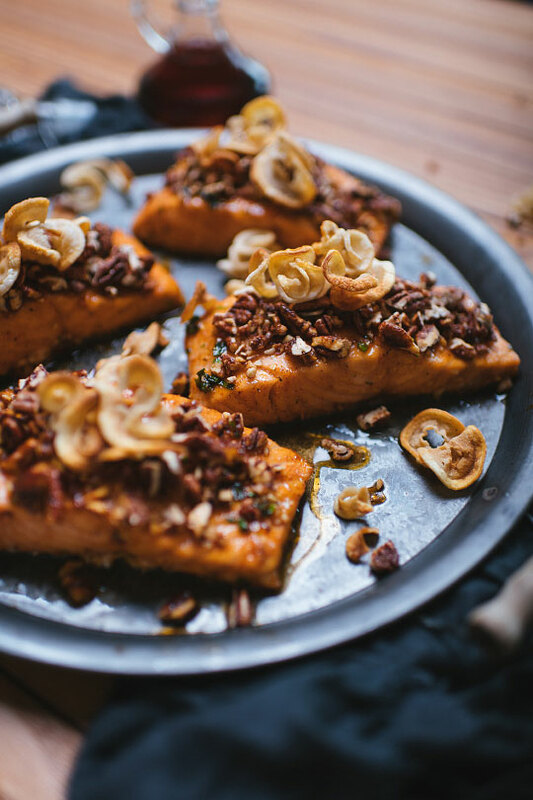 This maple salmon with praline pecans is the perfect recipe to celebrate the temps des sucres! Pork rind on top? ABSOLUTELY !!! Preheat the oven to 350°F. Cover a baking sheet with parchment paper. In a large bowl, add pecans, maple syrup and paprika and season with salt and pepper. Toss. Pour on the baking tray and spread well. Place in the oven and cook for 15 to 20 minutes. Stir halfway. Remove from oven and let cool for 15 minutes. Chop finely and set aside. Place the salmon on a large baking sheet covered with parchment paper. Set aside. In a large bowl, add the rest of the ingredients (except for the pork rinds), season with salt and pepper and mix. Brush the salmon generously with the sauce. 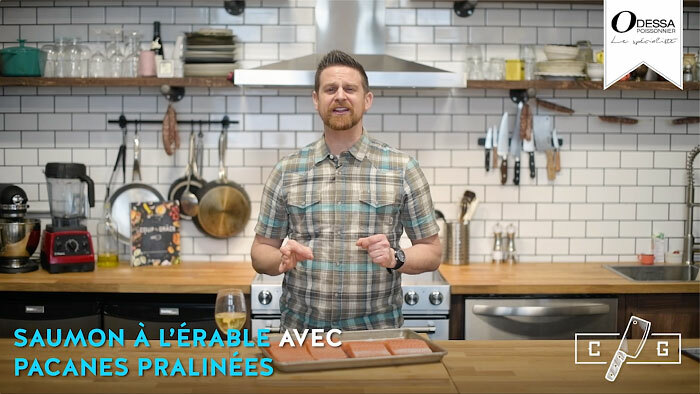 Place the salmon in the oven and cook for about 25 minutes, or until the salmon is cooked and the meat flakes easily with a fork. Brush the fish generously and regularly. Place the pork rinds on an aluminum plate and place in the oven when there is about 8 minutes left to cook the salmon. 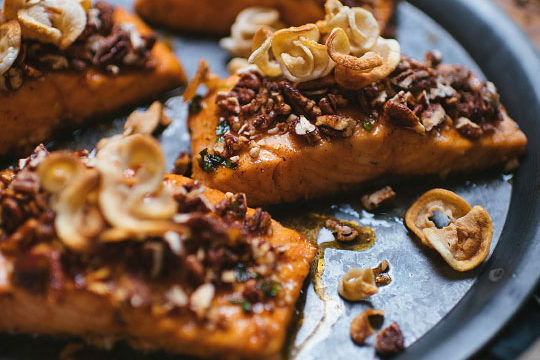 Remove the fish out of the oven, bury with pecans and garnish with pork rinds to taste! Accompany with a light to balance everything. Flavored with ginger and Sichuan pepper, this beer offers subtle notes of fresh bread hidden by citrus notes of pepper and ginger. The spicy taste of this beer will contrast with the sweet taste of the maple.